It was the second least-mysterious mystery of the day. 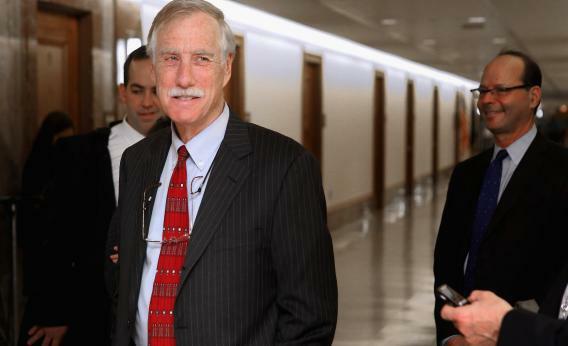 Sen.-elect Angus King of Maine, a former governor with gravitas to spare, ran as an independent. He refused to say which party he’d caucus with if/when he got to Washington. Republicans (led by the Chamber of Commerce) spent millions on ads meant to drive his numbers down and allow their candidate to win a three-way split. But King won more than 50 percent of the vote. And he wasn’t bitter. This morning, when King called a press conference to announce whether he’d caucus at all, a reporter asked whether the negative ads affected his decision at all. He was unsentimental about it. He wanted to get on the Finance Committee, even though freshmen were at a disadvantage for that job. “My father used to say, if you don’t ask, you don’t get,” he said. He had talked to Harry Reid and both of the Senate’s independents, who caucus with Democrats, to learn the ropes, and came away sounding sympatico. “The filibuster’s use, in recent years, has been excessive.” Finally, he got asked whether he thought about joining the other team.